Need a Small Engine Tuneup for your power tools or lawn equipment? After a few months of engine start-ups and stops while doing fall clean up work, make sure your small engines are tuned up and running in top condition for Spring. Stop by Foreman’s General Store starting November 15th through February 15th, 2019 and save $10 off with our Small Engine Tune Up Special! 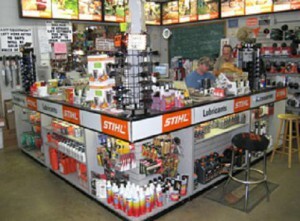 Foreman’s General Store has expert mechanics at our service desk to assist you. Visit Foreman’s General Store today for all of your small engine parts and services! Our service department can help you find your next new power tool, locate a part, or help you with a repair. Colleyville, Irving, Carrollton, Denton, Desoto, Lewisville, North Richland Hills, Arlington, Fort Worth, Dallas, & North East Texas. Parts shipped coast to coast in the lower 48 United States. This entry was posted on Sunday, January 20th, 2019 at 9:52 am	and is filed under Events, News & Updates. You can follow any responses to this entry through the RSS 2.0 feed. Both comments and pings are currently closed.